Any unsecured entrance to your building quickly becomes the weakest link and an easy target to exploit. The lobby of your building is only one part of the equation required to secure a building against threats, but who is managing the threats to your loading docks or your vendor entrances? By seamlessly integrating all aspects of your security SV3® allows you to transform a complex, dangerous situation into a truly secure and efficient operation. Our team takes an aggressive approach to managing threats to your business. As we always tell current clients and prospective clients, it’s not a question of “will there be an incident,” but rather “when will there be an incident.” With that said, it’s imperative to have measures in place to not only secure your facility, but most importantly, ensure the safety of your people. Building Intelligence Inc. has a number of solutions, to effectively close the gaps in your security. 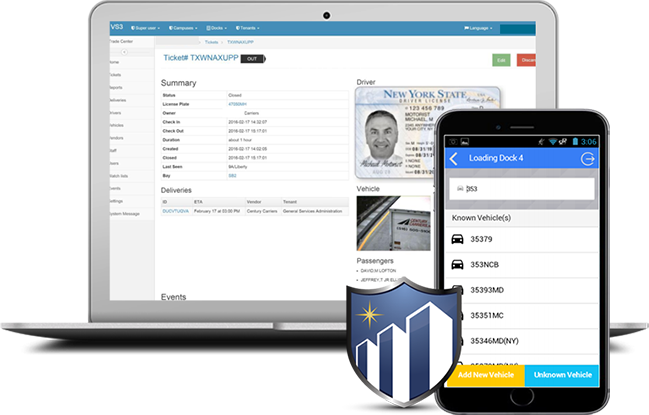 SV3® is an enterprise level software application that manages the entry of visitors, vehicles, and vendors. SV3® extends access control beyond traditional electronic security and allows security officers, concierges, and building staff to manage lobbies, loading docks and other entry points. Our technology allows us to keep your costs low by streamlining the process of securing your building to ensure that your staff and business are safe. Are You Doing Everything You Can To Secure Your Building? "SV3 is an award-winning state-of-the-art software application that processes the entry of vehicles, visitors and vendors."